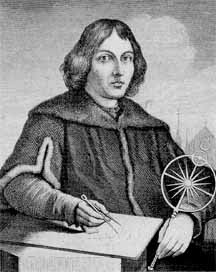 Nicolaus Copernicus was born on February 19, 1473 in Poland from two merchant families. He was the youngest of four children. At first, while being supported by his uncle, Copernicus studied at the University of Krakow in 1491, where he attained the mathematical and astronomical skill for his later achievements. He also was able to study the natural-science writings of Aristotle and Averroes while studying in Krakow. In 1495, Copernicus left Krakow because of his uncle Watzenrode wanted him to study law in Italy, hoping for Copernicus to join the Warmia canonry, which Watzenrode was the Prince-Bishop of. In 1497, Copernicus registered in the Bologna University of Jurists. In Bologna, Copernicus studied law, the humanities, and astronomy. He became the assistant of astronomer Domenci Maria Novara da Ferrara. Under Ferrara, he began to find peculiarities in Ptolemy's geocentric universe theory based on observations of the star Aldebaran. Copernicus moved to Rome in 1500, where he continued his astronomical studies. Copernicus also went to the University of Padua, where he studied medicine, which include astrology. Over his education, Copernicus learned Latin, Greek, German, and Italian along with his native Polish. Copernicus, after his studies, became his uncle's secretary and physician in Heilsberg. He took part in almost all of his uncles political, administrative, and economic activities. This is where Copernicus began work on his heliocentric theory. Copernicus also made trips on business from his uncle. In 1510, Copernicus ended work for his uncle, and worked as a translator of Greek and Latin texts. In 1514, the first outline of the heliocentric world was written. Throughout his life, Copernicus worked as a assistant to politicians and religious leaders while continuing to study astronomy. By 1532, his manuscript on heliocentrism was basically complete, but he resisted publishing due to fears of scorn. His book, De revolutionibus orbium coelestium, was published under Georg Rheticus, who had published other works of Copernicus. Along with Andreas Osiander, Rheticus worked to have the book published in 1542. Legend has it that the first copy of De revolutionibus ever printed was placed in Copernicus's hand on May 24, 1543, the day that Copernicus died. Copernicus makes our list for being one of the few people in the world who changed the world's mind. Before him, the common theory was that everything orbited the Earth. Copernicus proved them all wrong. He changed the way people looked at the world, and not many people can do that.